On the Air in Washington, Mo. Thursday (Sept. 27), I’ll head down I-44 to Washington, Mo. to appear from 8:35 a.m. to 9 a.m. on the Diane Jones Morning Show on KLPW AM 1220. The program streams live on KLPW.com. I wouldn’t be surprised if she quizzed me about the old John B. Busch brewery in Washington, which I write about on page 161 of Beer, Brats, and Baseball: St. Louis Germans, or about how the first Germans came to Washington. That’s on page 145. She also may ask me about an item in the second vignette mentions an alligator kept by Washington zither maker Franz Schwarzer. As far as I know, its name is forgotten. But I’d like to thing a German like Franz Schwarzer named it Hans. One person who bought a book (two, actually) was William Lemp. He’s an attorney and a descendant of the Lemp brewing family. I wrote about them in the “Beer, Brats, and Baseball” section of my book. My thanks to Ryan Rakel at Urban Chestnut for giving me space to sell my book. Earlier this week (Monday, Sept. 17) I shared an evening with more than 100 fellow Germanophiles at the St. Louis County Library Headquarters. I did about 30 minutes of readings and then took another 30 minutes of questions from people who really knew their stuff. Then it was back to the signing table, where I autographed 28 copies of Beer, Brats, and Baseball: St. Louis Germans. Two people followed me to the parking lot so they could buy copies of my first book, Hoosiers and Scrubby Dutch: St. Louis’s South Side I kept in my car. It was my idea of fun, and made all those long slogging months of writing worthwhile. The best part of all was the program called me a “historian.” That’s an honor. How about that, Bob? The release-signing party Sunday at Al Smith’s Feasting Fox restaurant was wunderbar! 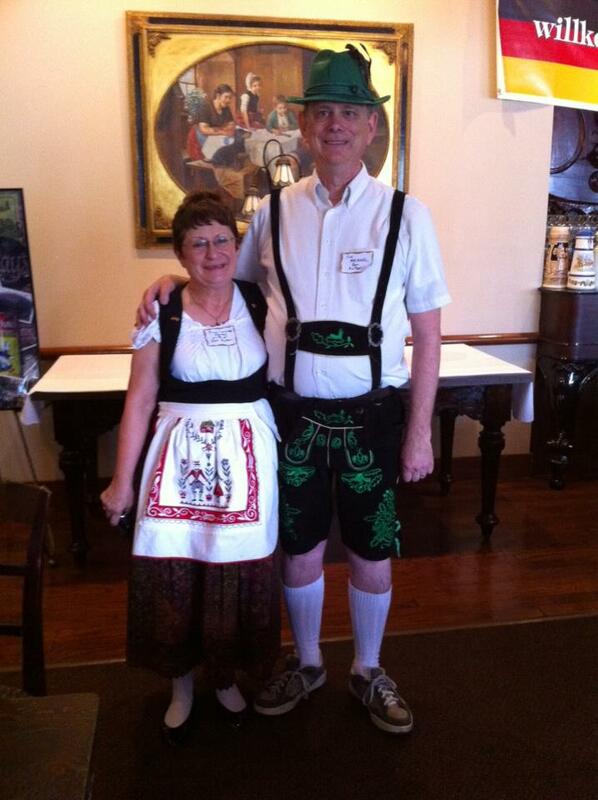 That’s me with Lorraine in our German getup. If you missed it, you missed it. But there will be other times to get an autographed book. Watch this space. This is it. Today’s the day. If you miss it, you can’t unmiss it. The release-signing party for my book, Beer, Brats, and Baseball: St. Louis Germans is today – Sept. 16 – from 2-5 p.m. at Gretchen’s Inn at Al Smith’s Feasting Fox Restaurant, 4200 S. Grand Blvd., St. Louis. Got some good comments when I sold and signed a few copies of Beer, Brats, and Baseball: St. Louis Germans at the German Cultural Society’s Oktoberfest tonight. The real test comes tomorrow, of course, at the release-signing party from 2-5 p.m. at Gretchen’s Inn at Al Smith’s Feasting Fox Restaurant, 4200 S. Grand Blvd., St. Louis. What will you say about the book? With just one – one day – left before my release-signing party, my historian friend Bob Mackreth from Lake Superior Country reminded me this is Von Steuben Day. The day celebrates Baron Von Steuben, a German military leader who served without pay in the Revolutionary War from Valley Forge to Yorktown. In New York, the 55th German American Steuben Parade was set to head down Fifth Avenue at noon today. It’s a marvelous event, as it should be. But are we St. Louisans to let New Yorkers outdo us? Never. 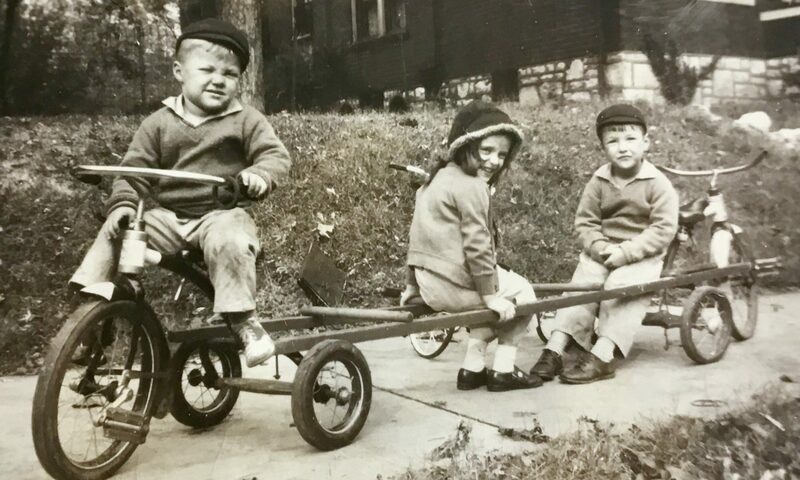 We’ll have more fun tomorrow at the release-signing party for Beer, Brats, and Baseball: St. Louis Germans.from 2-5 p.m. at Gretchen’s Inn at Al Smith’s Feasting Fox Restaurant, 4200 S. Grand Blvd., St. Louis. Come with $21.50 (cash or check) for a book I’ll personally inscribe, and prepared for three hours of non-stop gemütlichkeit. If you don’t know now what that word means, you will by the time the day’s over.